This complete mount Kilimanjaro climbing itinerary is the most successful climb on the mountain with 95 % of the climbers reaching the Uhuru peak. One of the best features of the route is the longer and slower ascent which gives the body time to acclimatize to the altitude gradually – this greatly increases the success rate. Pick up in Nairobi and transfer by shuttle bus to Moshi for overnight. Day 2: Drive to Kilimanjaro Londorossi Gate. After breakfast and briefing, drive to Londorossi Park Gate (2-3 hour dirve). From here a forest track requiring a 4WD vehicle leads to Lemosho Glades. Walk along forest trails to Mti Mkubwa (big tree) campsite. Day 3: Hike Mti Mkubwa Camp to Shira 1 Camp. After breakfast, we continue as the trail gradually steepens and enters the giant heather moorland zone. After several streams are crossed we continue over the Shira Ridge then gently downwards to Shira 1 Camp located by a stream on the Shira Plateau. Day 4: Hike Shira 1 Camp to Shira 2 Camp. After breakfast, a gentle hike across the plateau leads to Shira 2 Camp on moorland meadows by a stream. A variety of hikes are available on the Plateau, making this an excellent acclimatization day. 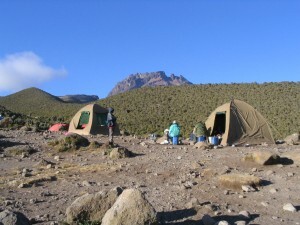 Day 5: Hike Shira 2 Camp to Barranco Camp. From the Shira Plateau we continue to the east up a ridge, passing the junction towards the peak of Kibo. As we continue, our direction changes to the South East towards the Lava Tower, called the “Shark’s Tooth” (elev 4650m). Shortly after the tower we come to the second junction which goes to the Arrow Glacier. We now continue down to the Barranco Camp. Although you end the day around the same elevation as when you began, this day is very important for acclimatization and will help your body prepare for summit day. Day 6: Hike Barranco Camp to Karanga Camp. Day 7: Hike Karanga Camp to Barafu Camp. Day 8: Hike Barafu Camp to Summit, down to Mweka Camp. summit between the Rebmann and Ratzel glaciers. You head in a northwesterly direction and ascend through heavy scree towards Stella Point on the crater rim. This is the most mentally and physically challenging portion of the trek. At Stella Point you will stop for a short rest and will be rewarded with the most magnificent sunrise you are ever likely to see. Faster hikers may view the sunrise from the summit. Day 9: Hike Mweka Camp to Mweka Gate, drive to Moshi. From the gate, continue another hour to Mweka Village. A vehicle will meet you at Mweka village to drive you back to your hotel in Moshi for overnight. Day 10: Transfer by shuttle bus back to Nairobi. 2 nights accommodations in a mid-class hotel (Bed and Breakfast), before and after the climb. All park fees, including mountain rescue fees, and government taxes. Transport from your hotel to the mountain, and back to your hotel.